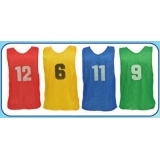 The Champion Sports Adult Practice Vest with Numbers is made of 100% nylon micro mesh. Available in six vibrant colors and sold in dozens, these scrimmage vests are numbered 1-12 and will help you identify your teammates during scrimmages and games! 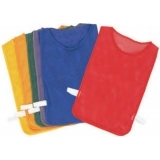 The Champion Sports Adult Pinnie is a deluxe nylon mesh pinnie with a one piece elastic waistband. 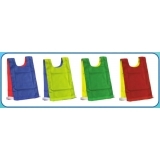 Available in six vivid colors and sold in dozens, these pinnies are great for identifying players while practicing on the court or field. 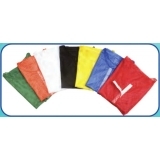 These Champion Sports Adult Practice Vests are made of 100% nylon micro mesh. 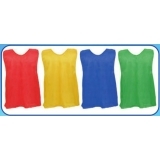 Available in six vibrant colors and sold in dozens, this practice vest will help you identify your teammates during scrimmages and games! The Champion Sports Deluxe Scrimmage Vest is ideal for football and hockey scrimmages, as they will fit over shoulder pads. Made of deluxe heavy-duty mesh, this vest has a Velcro® front closure for easy wear and removal. The extra large pattern works for any size athlete! The Champion Sports Numbered Heavyweight Pinnie is a heavyweight nylon pinnie with a one piece elastic waistband. 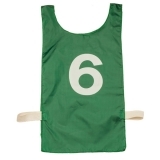 Available in eight vivid colors, and numbered 1-12, this youth size pinnie is sold in dozens. 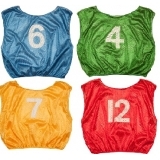 These pinnies are great for identifying players while practicing on the court or field. 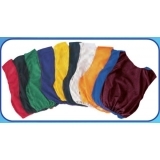 The Champion Sports Heavyweight Pinnie is a heavyweight nylon pinnie with a one piece elastic waistband. 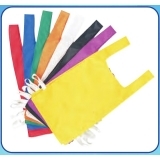 Available in eight vivid colors, this youth size pinnie is sold in dozens. 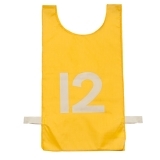 These pinnies are great for identifying players while practicing on the court or field. The Champion Sports Adult Practice Scrimmage Vest is made of 100% nylon micro mesh with a reinforced neck, armholes, and an elastic bottom. Available in ten vibrant colors and sold in dozens, this scrimmage vest will help you identify your teammates during scrimmages and games! The Champion Sports Adult Practice Scrimmage Vest with Numbers is made of 100% nylon micro mesh with a reinforced neck, armholes, and an elastic bottom. Available in ten vibrant colors and sold in dozens, these scrimmage vests are numbered 1-12 and will help you identify your teammates during scrimmages and games!